Ty Beanie Babies - The first Beanie Babies were introduced to the world in late 1993 at the World Toy Fair in New York City, these first nine would become known as the "Original Nine." These beanies were a new style plush all together, instead of the typical stuffing that accompanied most plush toys these had a combination of 'beans' and stuffing. The 'beans' or small plastic PVC pellets gave these plush a new uniqueness. You could now make your animal sit up in various posable positions. The critics were skeptical, some even nicknamed them, "Road Kill," due to being under-stuffed and filled with beans. Original Ty Beanie Babies Pretzels the Dog Original Ty Beanie Babies Bernie the Dog - Retir.. 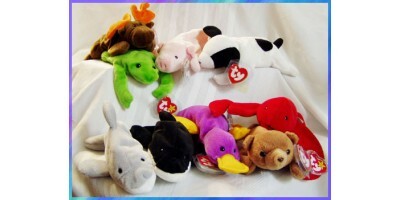 Original Ty Beanie Babies Pretzels the Dog Original Ty Beanie Babies Original Ty Beanie Babies P.. Original Ty Beanie Babies Pretzels the Dog Tracker the Dog Beanie Baby - Retired Authenti.. Original Ty Beanie Babies Velvet the Black Cat Velvet the Black Cat Beanie Baby - Retired ..